Novomatic takes players beneath the ocean waves in Tidal Riches. This isn’t a typical video slot from the Austrian developer as it’s played using a symbol drop game engine where the number of paylines increases with each symbol drop win. There’s also a free spins round with transforming mystery symbols. Play in Hi Roller mode to bring mega wilds into play. Stakes range from between 20p and £100 per spin. Many Novomatic video slots can feel a bit manic but there’s a tranquil feel to Tidal Riches. The reels are set behind an ocean backdrop. Joining the lower value A to 10 royals are fish, turtles and octopuses. The dolphin is the best paying symbol. Land 3, 4, 5 or 6 of these and you’ll win a payout equal to 0.4, 6, 15 or 30 times your total bet. There’s also a wild that replaces all of the standard symbols. Your first spin takes place on a standard 5 reel, 20 payline machine. Land a winner and the successful symbols are replaced and new ones drop in and replace them. 1 of the arrows above the reels is illuminated and the octopus to the right of the reels drags a plant to open up a 6th reel and give you win both ways payouts. Manage more successive win and 4th and 5th rows are opened and the paylines increase to 40 and then 50 – both with a win both ways mechanic. This is known as the Reels Drops feature. Get on a run and light up 4 or more arrows and you’ll trigger the Free Games feature with 5 free spins. Also thrown into the mix are special treasure chest symbols. These all transform into the same matching symbol whenever they hit. The more successive symbol drop wins you hit, the more free spins and the bigger the treasure chests awards. They can be single, stacked, 2×2 or 3×2. You can also win additional free spins – finally, the arrow meter resets back to zero following a winless free spin. Up your stakes to 5 or 10 times your total stake and you can play in Silver or Gold Hi Roller feature. Here you’ll receive 3 spins complete with oversized mega wilds. In Gold Mode, the arrow meter doesn’t reset following a losing symbol drop which allows easier access to the all-important Free Games feature. 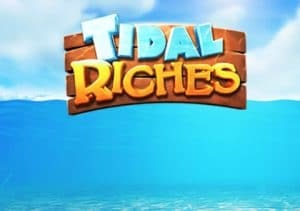 Tidal Riches offers something a little different from your usual common or garden Novomatic-powered video slot. It comes together rather nicely in fact. The visuals are decent enough and there’s a soothing feel to the backing track. The symbol drop game engine and free spins with extras are solid enough too. The volatility is in the medium range with top wins of 1,500 times your bet. Get lucky in these virtual waters and Tidal Riches could live up to its name. If you like unusual Novomatic games, Snake Rattle & Roll is worth playing.